Sometimes, it becomes necessary to connect more than one transformers in parallel, for example, for supplying excess load of the rating of existing transformer. 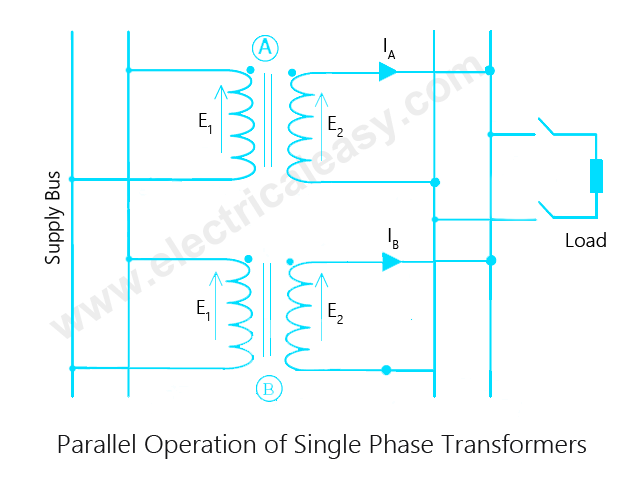 If two or more transformers are connected to a same supply on the primary side and to a same load on the secondary side, then it is called as parallel operation of transformers. Why parallel operation of transformers is needed? Increased Load: When load is increased and it exceeds the capacity of existing transformer, another transformer may be connected in parallel with the existing transformer to supply the increased load. Non-availability of large transformer: If a large transformer is not available which can meet the total requirement of load, two or more small transformers can be connected in parallel to increase the capacity. Increased reliability: If multiple transformers are running in parallel, and a fault occurs in one transformer, then the other parallel transformers still continue to serve the load. And the faulty transformer can be taken out for the maintenance. Transportation is easier for small transformers: If installation site is located far away, then transportation of smaller units is easier and may be economical. Voltage ratio of all connected transformers must be same. If the voltage ratio is not same, then the secondaries will not show equal voltage even if the primaries are connected to same busbar. This results in a circulating current in secondaries, and hence there will be reflected circulating current on the primary side also. In this case, considerable amount of current is drawn by the transformers even without load. The per unit (pu) impedance of each transformer on its own base must be same. Sometimes, transformers of different ratings may be required to operate in parallel. For, proper load sharing, voltage drop across each machine must be same. That is, larger transformer has to draw equivalent large current. That is why per unit impedance of the connected transformers must be same. The polarity of all connected transformers must be same in order to avoid circulating currents in transformers. Polarity of a transformer means the instantaneous direction of induced emf in secondary. If polarity is opposite to each other, huge circulating current flows. This condition is relevant to poly-phase transformers only. If the phase sequences are not same, then transformers can not be connected in parallel. The short-circuit impedances should be approximately equal (as it is very difficult to achieve identical impedances practically).